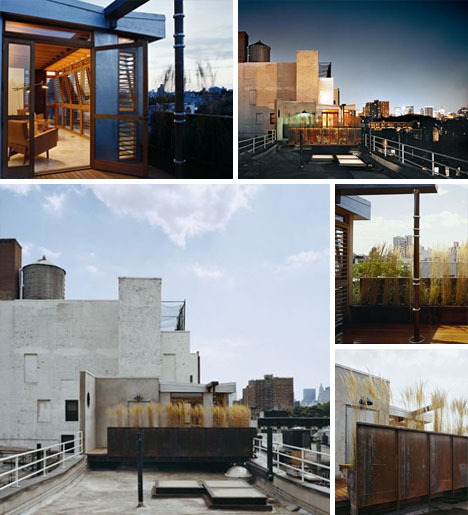 Weathered wood and concrete, rusted metal and rustling wild grass – nothing about this winding rooftop deck viewed from within suggests it could not be the back porch of a European country home. Nothing, that is, until you catch glimpses of the marvelous Manhattan skyline in the background. Likewise, nothing about its immediate surroundings suggests it to be anything but an overgrown roof-gone-wild, possibly the top of some aged warehouse building in an abandoned industrial town. 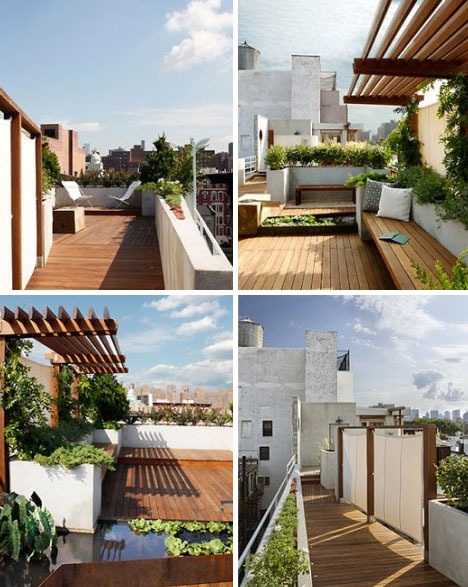 Trellises, ponds, paths and fountains make this remarkable deck space as hard to pin down in time as it is in style – modern in its simplicity but timeless in terms of the materials used – a comfortably rusticated and well-planted retreat right in the heart of the city. Teak, bronze, zinc and rust-ready steel were added by Pull Tab designs to make this new addition to an antique walk-up apartment building blend as naturally as possible into its aged surroundings. 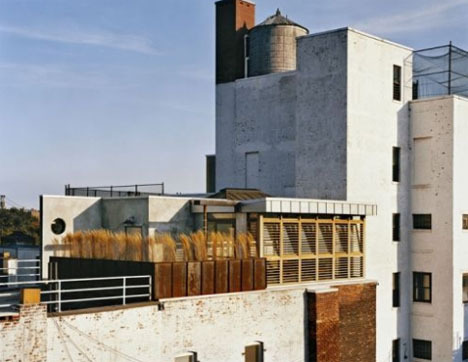 Though there are strict city codes limiting the possibilities for rooftop additions in downtown New York City, this indoor-yet-outdoor solution made the project possible. 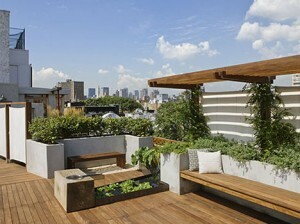 However, it clearly also created an opportunity to make a unique secluded series of outdoor spaces in otherwise industrial surroundings. There is new outdoor furniture technology available and there are many new styles and materials to choose from, when planning what kind of patio furniture would suit you and your house. Terrific work! This is the type of information that should be shared around the web more often.